We’ve had to say goodbye to an alarmingly large number of celebrities lately. 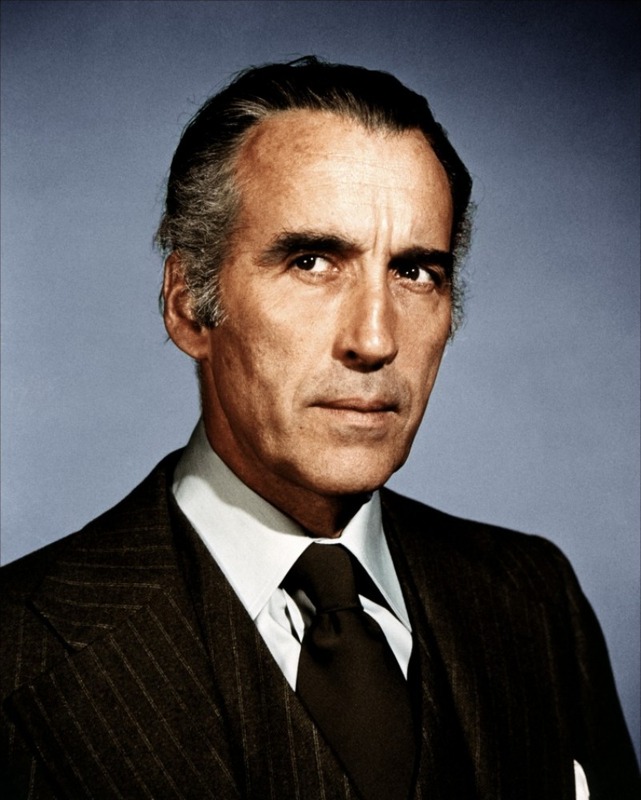 Today we give a farewell I’ve been dreading for a few years now; film legend Christopher Lee has passed away at the impressive age of 93. But what an amazing 93 years he had! Lee was not only a titan of an actor with a career spanning nearly 70 years and hundreds of films, but also an avid golfer, a musician (his heavy metal Christmas carols have become an annual holiday tradition in my household), and a veteran of World War II, where he served in the Royal Air Force’s intelligence division. This is a man whose life was as interesting, if not more so, than many of the films he was in. His reputation as a horror icon began with his years at Hammer Studios, where his considerable height and imperious presence helped him re-interpret classic monster characters such as Frankenstein’s monster, the Mummy, and particularly Dracula, making them his own and scaring new generations of kids. His Frankenstein monster evokes such sympathy, shambling about like a sad, homicidal zombie, His mummy was a juggernaut storming through windows in pursuit of lost princesses. His Dracula was commanding and elegant, selling the hypnotic powers of the count in a way we had never seen before. Those movies would also pair him with Peter Cushing, who would serve as his on-screen foil and his off-screen best friend throughout their lives and careers. Any movie they were in together, even the cheap ones, was energized by their rapport. Perhaps Lee’s greatest horror role is in The Wicker Man, a film he considered to be one of the best he ever appeared in. This mystery thriller saw Lee cast as the leader of an insular pagan community investigated by Edward Woodward’s police detective following a suspicious disappearance. The film’s story (and especially its ending) upended audience expectations and Lee followed suit with his portrayal of Lord Summerisle; where one might expect Lee to give a spooky and intimidating performance as a cult leader, he instead chose to instill his character with wit, charm, and good humor, all of which serve to keep Woodward’s character and the audience off-balance. But Lee wasn’t content to remain a ‘horror actor,’ showing off different aspects of his acting abilities throughout his career. Even his many villains have diverse qualities, from the dashing and suave demeanor of his debonair assassin from the James Bond thriller The Man With the Golden Gun to the athleticism of his swordfights as the evil Rochefort in Richard Lester’s Musketeer films. Lee once claimed to have performed more cinematic swordfights than any other actor. In his later career he got the chance to display his comedic talents as well, playing a buffoonish Nazi commander in Steven Spielberg’s 1941 or having fun as the daffy geneticist in the zany Gremlins 2. His sonorous voice also got him work doing vocal performances for animated projects such as The Last Unicorn, the Soul Music television series, and the Kingdom Hearts video games. As viewers who grew up with Lee’s work became filmmakers themselves, they brought him back to mainstream prominence. Director Tim Burton found quirky roles for Lee in films such as Sleepy Hollow, Charlie and the Chocolate Factory, and Dark Shadows. Lee was cast in some of the biggest films of the past two decades, earning new legions of fans with his performances as the evil wizard Saruman in The Lord of the Rings and The Hobbit movies (and serving as a general consultant for the productions due to his love and vast knowledge of J.R.R. Tolkein’s literary universe) and as Sith lord Count Dooku in the Star Wars prequels. Contrary to the imposing screen image Lee cultivated throughout his career, his co-stars and collaborators describe him as a courteous and witty colleague who was happy to share stories and experiences from his incredible life. While his passing is a great loss, at least the fond memories of those who knew him, worked with him, or just enjoyed his work on the movie screen will ensure he remains just as immortal as a certain vampiric count from Transylvania. Farewell and thank you, Sir Christopher Lee.